LoBok is a Chinese radish that forms large oval roots and is interchangeable in recipes that calls for Daikon radish. The LoBok has a flesh that is firm and crisp and its flavours range from sweet and mild to pungent. LoBok is also known as White Radish, and in Japan as Daikon or Daikon radish. A popular Asian veggie does not look like the small, round red radishes that we find in tossed green salads. 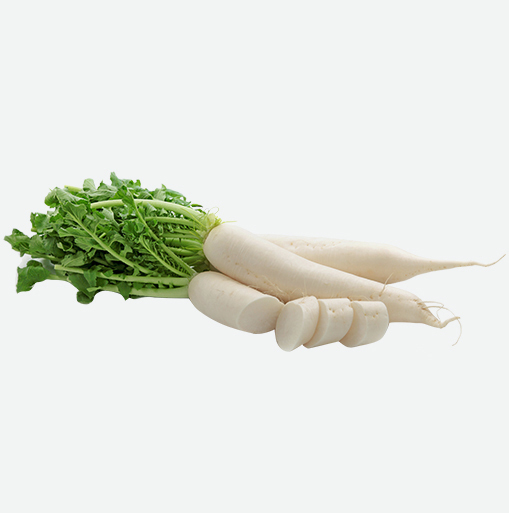 Instead, Chinese white radish, or the “Raphanus sativus”, which is its scientific name, looks like a large white carrot. In Japan, chefs rely on LoBok or daikon radishes to add a bite and flavour to relishes and salads. In China it is used more in cooking. Chinese cooks add LoBok to soups, stir-fries and “red-cooked dishes”, where the food is slowly simmered in soy sauce. Turnip Cake made with LoBok or the Chinese white radish is a popular Chinese New Year dish. LoBok or daikon was traditionally pickled in the late fall to preserve vegetables for the winter. One of the most popular varieties of pickled LoBok is called “takuan” in Japanese and “danmuji” in Korean. Legend has it that a Buddhist monk called Takuan Soho used this radish to make the first pickle. LoBok is very low in calories. Just a 3 ounce serving contains only 18 calories and provides a good source of vitamin C which is important to healthy teeth and gums. LoBok is also a good source of betacarotene and calcium. Calcium is an important mineral for healthy bones and connective tissue. This interesting radish also contains active enzymes that helps with the digestion of starchy foods. Select LoBok that that feels heavy and is firm to touch. Look for LoBok that is free of soft spots or mold spots. LoBok will keep well in the refrigerator for up to two weeks if they are placed in a sealed plastic bag so they can maintain a high humidity level. To prepare LoBok, wash and peel it as you would carrots. Then, slice, chop or grate this radish as needed for the recipe you are using. Both LoBok and Daikon can be used raw and also stand up to long cooking time. When used in cooked dishes it is best to prepare this vegetable by sprinkling with salt and letting it stand for 20 minutes, rinse the vegetable well before adding it to the recipe. This process will keep the LoBok crisp when cooking. LoBok can be used raw in salads or side dishes. It can be pickled, used in stir-fry dishes, braised and boiled. This vegetable is also popular used in soups and stews.